It's 2014, and social media includes a lot more than just Facebook and Twitter. 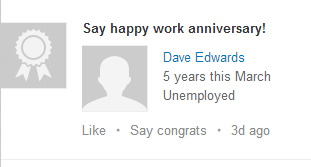 Enter LinkedIn, the premier business networking tool. 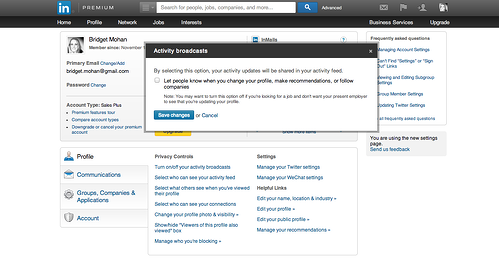 LinkedIn offers the opportunity to build your professional brand as well as your network. LinkedIn is arguably the most important social media outlet for anyone looking to grow their career and keep the door of opportunity open. Like a well-executed marketing plan, a certain amount of strategy and finesse goes a long way. I come across too many career killing "professional" profiles that are downright failing on LinkedIn. Happy Friday everyone and welcome to this week's edition of Friday Fails. I'm Bridget and this week we are going to be talking about fails on LinkedIn. So first, let's talk a little bit about what LinkedIn is and what LinkedIn isn't. LinkedIn is an exceptional venue for business networking. It's a great place to create your professional brand while highlighting a little bit of your personality and expanding your business network. LinkedIn isn't a great opportunity to share stories about your pets, your kids, or your personal life. First of all, if you don't have a profile picture, that's the biggest fail so far. Second of all, I don't want to see a picture of you and your new husband at your wedding. I love love, but I don't want to see it in a business forum. I don't want to see a photo of you and your besties drinking some beers, cause guess what? That's meant for Facebook! You can have a head shot done, and it doesn't have to be professional! Have a friend, family member or coworker take a good photo of you. 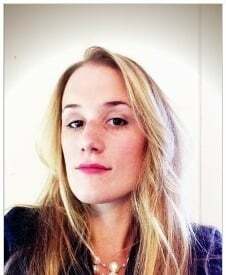 Another great way to fix your profile photo is to make it relevant while still keeping it business worthy. For example, if you work in the horse industry and you're an equestrian, you can have a photo of you horseback riding. You can use a photo that is relevant to your industry to network, connect with those people in that business, while still showing something you're passionate about. Another example would be if you're into athletics and work for a lifestyle company, you could have a photo of you doing an adventure race or a mud run. It's still business relevant and fits within your network. Another important fail is the information you include on your profile. So I see that you're relevant to me, I'm going to click on your profile and have a look at you. What's within your profile is vital for me to continue to network with you and to respect you as a business person. Keep the information relevant. Don't say like this gem here from 1986 who worked at Pizza Hut, yet now you're getting your PhD. I don't really need to know that you worked at Pizza Hut! It's great that you're getting your PhD! I want to learn more about that and what you're doing today, not what you were doing in the 80s. Another fail is I don't need to know how many classes you took in 1996 and what the classes specifically were. That was ages ago! It's great that you went to school and I'd like to see the college you went to and what kind of degrees you received. I don't need to know a class by class breakdown of what you studied, cause I don't really care! So how do you fix this fail? What I do like to see is what's relevant to you today and probably within the past 10 years. I want to see the industry experience that you've gained, and maybe some certifications that you have. For example, if you're inbound certified or HubSpot certified, that's great for me to know. So keep training and relevant certifications up to date, job experience up to date, and really keep it within a decade. Don't bore me with what you were doing when you first graduated from high school. So now we've talked about your profile. You're going to keep it up to date, fresh, and tell me about the training you've done or any certifications you've received. So guess what? Now you're blowing up my news feed. Fail. I don't want to see every time that you update your profile, I just want to see the finished product. So one way to fix this is to go into your settings and change what's promoted. So now every time you tweak your photo or update your trainings and certifications, it doesn't blast my news feed and bore me. The one thing that I do want to see in my news feed is when you've received a promotion or you've gotten a new job. That's great, you're awesome, and you're doing better and growing in your business and in your experience. I want to know that because maybe down the road I want to hire you or work with you. So keep it up to date, don't bore me with the little details, and give me the big picture. Another fail we see is really related to social media. Don't over creep me. I can see when you've looked at my LinkedIn profile, and I can see if you're a repeat creeper. So, if you're looking at my profile and want to check out what I've been up to, the best thing to do is to turn your profile to anonymous. That way every time you look at my profile I can't see who you are. By seeing who you are I can decide whether I'm interested in doing business with you or adding you to my network, or if it's overdone, I can just be freaked out and block you. Welcome to 2014! If you don't have a LinkedIn profile, you're failing miserably. Get up to date, start networking, build your business brand (we just did a little bit for your personal brand), make you relevant, and make it possible for me to find you. Follow these tips and don't be a big failure. Show me what kind of business experience you have, if you're worth networking with, and we will connect on LinkedIn! So thanks for tuning in, happy business networking, and stay tuned next week for another Friday Fails!